This guide is intended to show you everything needed to get your podcast up and running…all the technical stuff. This guide assumes that you have a name, topic, and format for your podcast and are ready to start recording. Audio quality is one of the most important things to focus on for your episodes. If you're just starting out, don't spend hundreds of dollars on equipment. 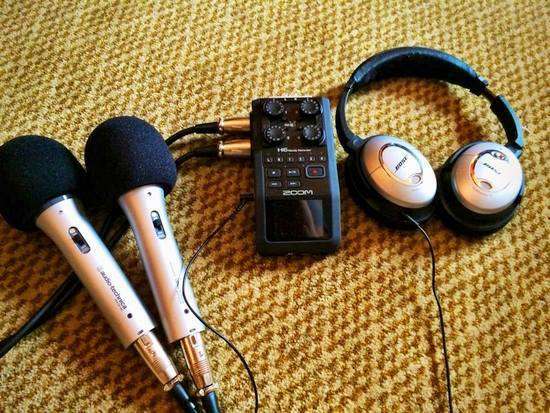 Your smartphone or your computer and its built-in microphone (or a USB microphone) are all you need to record a local interview (i.e., all guests are in the same location). If your guests are in different locations, Zencastr is a great option to record a remote conversation. Cardioid USB Microphone (mic) – one for each guest. Windscreen – one for each mic (reduces the occurrence of wind, breath sounds, and popping noises). Noise Cancelling Headphones – for each guest, so that they can clearly and easily hear each other and monitor the conversation. This helps everyone talk at more appropriate levels rather than overly projecting their voices. It also helps you identify recurring noises while recording (e.g., the hum of a refrigerator) that could be distracting to your audience and may be hard or time-consuming to eliminate during editing. Portable Recorder – to record the conversation. This recorder has the ability to record 1-4 people (i.e., has slots for 1-4 microphones). XLR Microphone Cable – connects microphones (#1) to portable recorder (#4). Headphone Audio Splitter – the recorder above (#4) has only one headphone output, so this splitter will allow up to four guests to hear/monitor the conversation in their own headphones (#3). Memory Card – get a high quality one to save your recordings. Note: if ALL your episodes are long-distance, you only need the mic (#1), windscreen (#2), and headphones (#4). All equipment can be found in this Amazon Idea List, including a 3-in-1 microphone (cardioid mic + headphones + windscreen). I use Adobe Audition to edit my podcast recordings, but Audacity is a great, free option (used it for years). Here are resources to learn how to edit recordings in Adobe Audition and Audacity. Note: I use Auphonic to “clean” up my audio and make it sound better (e.g., reducing background noise and hums, normalize loudness of the audio, balance levels between speakers, etc.). There are two things required in order for people to be able to listen to your podcast episodes: (1) a service to host each episode's audio file; and (2) a player, either on your website or an app, for people to listen to your episodes. A best practice is to make your episodes available on multiple player/platforms. There are many options out there and Libsyn, Soundcloud, and Anchor are a few of the more popular hosting platforms. For my podcast I use Anchor. Podcast Places has a directory of all the places your podcasts can be published and instructions for how to submit your podcast. If you use Libsyn, they will walk you through the steps to submit your podcast to these platforms listed above. Note: When this article was originally written, I was using Libsyn to host the audio for my podcast. I switched to Anchor in December 2018. I debated whether to remove these next two paragraphs since I no longer use Libsyn, but decided to keep them here. Libsyn has a service that connects your podcast to certain social media accounts and will post a link to your new episodes when they are released. This feature exists for YouTube, Facebook, Tumblr, Twitter, and LinkedIn. If selected, Libsyn will even convert your audio podcast to video and upload the video directly to Facebook and YouTube so that your guests can listen on each site (here are examples on Facebook and YouTube). When promoting your podcast, it's important to experiment. Test to see where you get the most response. And compare the likes and comments to actual statistics (you may not get a lot of likes on your Instagram posts, but your statistics may show that most listeners are coming from Instagram). Also don't be afraid to ask your friends and guests to promote your podcast. Be sure to have a website and create show notes for each episode. Include links to things you reference in the episode in your show notes (more about show notes | how to format them), Here's an example from my podcast. WordPress, Tumblr, or Squarespace are options if you don't already have a website. Of the podcasts I subscribe to, Side Hustle School, Longform, and Happier with Gretchen Rubin have great show notes, in my opinion. Artwork is required in order for your podcast to be approved and published on different destinations. I use Canva to create my podcast's artwork. Podcast Artwork: must be in jpg or png format and sized 3000 x 3000 (minimum size allowed is 1400 x 1400). Look at the album art others use (it's best to open Apple Podcasts directly in iTunes). Here is my podcast's artwork. Episode Artwork: this is optional, but I prefer for each episode to have custom artwork. Otherwise, you can use your main podcast artwork for every episode. The same dimensions apply (3000×3000 or 1400×1400). Here's an example from one of my episodes. Video Artwork: If you plan to publish your episodes in video format on Facebook and YouTube, create a widescreen image that is 1920 x 1080. Here's an example. Here's a list of all the podcasts I'm currently listening to (also a great place to see different artwork examples).